Many organizations function with an internal focus, and that becomes apparent when customers interact with their various products, services and employees. Every interaction a customer has with an organization has an effect on satisfaction, loyalty, and the bottom line. Plotting out a customer’s emotional landscape by way of a Customer Journey Map, or Experience Map, along their path sheds ­­­­light on key opportunities for deepening those relationships. A Customer Journey map is a visual or graphic interpretation of the overall story from an individual’s perspective of their relationship with an organization, service, product or brand, over time and across channels. Occasionally, a more narrative, text-based approach is needed to describe nuances and details associated with a customer experience. The story is told from the customer’s perspective, but also emphasizes the important intersections between user expectations and business requirements. Inspired by user research, no two journey maps are alike, and regardless of format they allow organizations to consider interactions from their customers’ points of view, instead of taking an inside-out approach. They are one tool that can help organizations evolve from a transactional approach to one that focuses on long term relationships with customers built on respect, consistency and trust. All organizations have business goals but leveraging customer journeys as a supporting component of an experience strategy keeps customers (or members, patients, employees, students, donors etc.) at the forefront when making design decisions. They can be used in both current state review and future state visioning to examine the present, highlight pain points and uncover the most significant opportunities for building a better experience for customers. Customer engagement is not simply a series of interactions, or getting people to visit a website, “Like” something on FaceBook, or download a mobile app. Genuine engagement centers on compatibility, and identifying how and where individuals and organizations can exist harmoniously together. Giving thought to how your organization/product/service/brand fits into customers’ lives is crucial. I also use journey maps to gain internal consensus on how customers should be treated across distinct channels. Holding collaborative workshops with cross-disciplinary teams mixing people who otherwise never communicate with each other can be extremely valuable in large organizations in particular. Illustrating or describing how the customer experience could be brought to life across channels allows all stakeholders from all areas of the business to better understand the essence of the whole experience from the customer’s perspective. How do they want to be spoken to, what are they thinking, feeling, seeing, hearing, and doing? Journey maps help us explore answers to the “what ifs” that arise during research and conceptual design. What Components Does a Journey Map Include? Supporting characters: peripheral individuals (caregivers, friends, colleagues) who may contribute to the experience. Consider organizational goals for the product or service at large, and specific goals for a customer journey mapping initiative. Review all relevant user research, which includes both qualitative and quantitative findings to provide insights into the customer experience. If more research is needed, get those research activities in the books. Some of my favorite research methods include customer interviews, ethnography & contextual inquiry, customer surveys, customer support/complaint logs, web analytics, social media listening, and competitive intelligence. As a team, generate a list of the customer touchpoints and the channels on which those touchpoints occur today. Then brainstorm additional touchpoints and/or channels that can be incorporated in the future journeys you will be mapping. For example, the touchpoint could be “pay a bill”, and the channels associated with that touchpoint could be “pay online”, “pay via mail” or “pay in person”. Empathy maps are a depiction of the various facets of a persona and his or her experiences in a given scenario. This exercise helps me organize my observations, build a deeper understanding of customers’ experiences, and draw out surprising insights into what customers need. Empathy maps also provide a foundation of material to fuel journey mapping. The goal is to get a well-rounded sense of how it feels to be that persona in this experience, specifically focusing on what they’re thinking, feeling, seeing, hearing, saying and doing. The goal of lensed brainstorming is to generate as many ideas as possible in a short period of time. To gain focus as I generate ideas I use “lenses”—words representing key concepts, brand attributes or mindsets that help us look at a problem or scenario in a different way. For this exercise I recommend that the team agree on 3-5 lens words (for example: accessible, social, comforting), then set the clock for 2 minutes per lens word. Each person individually writes down as many ideas as they can think of in that time. After 2 minutes switch to the next lens word until all lens words have been used as idea inspiration. This ensures that every voice on the team is heard and generates a huge inventory of ideas. This is a method to visually organize ideas and find cohesion in the team’s concepts. Affinity diagramming helps us shift from casting a wide net in exploring many possibilities, to gaining focus on the right solutions for this audience. All team members should put their ideas generated in the lensed brainstorming activity up on the wall. Have someone sort the ideas into categories and label them. As a group, begin to consider where you might combine, refine, and remove ideas to form a cohesive vision of the future customer experience. Drumroll, please. This is the part you’ve been waiting for! It’s now time to put together all the pieces: timeline, touchpoints, channels, emotional highs and lows, and all the wonderful new ideas the team generated for how to improve the future customer journey. Get creative with how you lay it out—it doesn’t have to be a standard left to right timeline. It could be circular or helical. It could be one large map or it could be an interactive, clickable piece with embedded video. There are no templates, and there are infinite possibilities. Journeys don’t always become a sophisticated deliverable—sometimes they begin and end as sticky notes on a wall or sketches on a whiteboard. But most of the time, when you go through the activities to arrive at a solid customer journey map, you want to polish it, leverage it in your work and share it with colleagues across the organization. If visual design isn’t your strong suit, consider collaborating closely with a visual designer who can transform the journey map sketch into an impressive artefact. While journey maps are usually a tangible deliverable, like the one above, the process of journey mapping is what’s most important – it pushes us to think deeply about how we can use experience design to have a positive impact on our customers. It can be beneficial to maintain journey maps over time. For example, you could set a time each quarter or year to evaluate how your current customer experience matches your documented vision journeys. If your organization tracks quantitative KPIs, you can integrate these into a journey benchmarking process. Socializing journeys among stakeholders is critical in moving your organization toward action. In addition to prioritization, the output of a journey map can serve as a backbone for strategic recommendations and more tactical initiatives. For example, if you’re a mortgage company and you identify the closing process as a key area of frustration, anxiety and opportunity for engaging with the customer and designing for the “moment of truth”, then mark this as a high priority and get that on your strategic roadmap. Schedule enough time to properly go through the recommended process. I’ve found that you can document a current state journey in about 3 hours, and a future state journey in about 5 hours. This makes for a full day to do both for one persona. Make sure a good mix of people are involved in the journey map creation. It’s helpful to have stakeholder participants from many areas of the organization, as well as people of varying levels of seniority. Once the journey maps are created, share them with zeal. Shout them from the rooftops and display them prominently in common areas. The post is incredibly good and very well explained. Well done Megan. Thanks UX Mastery for gathering this content and people. Thanks Justin—I agree Megan did a great job explaining it, and we’re pretty proud of the resulting animation! Keep an eye on the site as we tackle other UX techniques. Megan – can you kindly post a better quality image to your final visual please – it certainly seems it will be worth reading your output. Good work! Your process and explanations are easy to follow and very useful. I love the video too. I help people & groups as they through change and an early step in creating a compelling future is gaining a shared understanding of where we actually want to go. Techniques like the ones you’ve described here are so important to structuring the kind of dialogue needed to build that understanding! Great article Megan! As a Customer Journey Research provider from The Netherlands, it’s very interesting to read. The process and examples are well explained! This is a really great article. It is well written and a step-by-step tool for mapping and exploring user journeys. The video is also excellent! Thanks! Just doing a little bit of research on customer journey maps for a talk and boom!! here you are!! This is very helpful information!!! Great work. Thanks for sharing your methods. Thanks for this article! However, several points are still unclear. For example – step 5) Brainstorm with Lenses. What exactly is the team brainstorming for? What ideas are we looking for? Shouldn’t the customer journey map be based on observing what frustrations and triumphs people have at each stage in the journey? Similarly, I didn’t understand clearly how affinity diagramming fit into this process. Is it simply gathering and organizing all the data from research into potential steps in the customer journey? Hope to hear from you soon! :) And thanks again! I had the same thought. I assume these are the steps for creating a future state journey map, not a current state. Great post Megan! Thank you for the explanation and process mapping. Thank you for your post and the video! We also created a tool to create customer journey maps online – http://uxpressia.com. Beautifully explained…Amazing how relevant this is for transporting your customer to a virtual world during a sales demo! Very nice article & informative vide, ths for the share. Thanks for the great information. Very helpful and well-outlined. Much appreciated! Love the intelligence and delivery. Off to put to good use hopefully! Thank you Megan. Thank you for your thoughtful post. I’m finding that different groups in my company (engineers, sales, client services) all want and could benefit from user research assets such as personas and journey maps. However, they each prioritize different content. Do you happen to know of a tool that enables storing and maintaining a lot of content pieces (modules) about a persona and enables dynamic updating of “child” content? For example, if I tweaked the empathy map in the master, all the child artifacts that included the empathy map would be updated. I’d be happy to pay for a good solution, but have not found any. I also work on a mac… Thanks in advance for your help! hi Megan thanks for your post being a student I have to create an assignment of a customer journey map of any service or any product can you tell me which software is to be used for this purpose. Thanks for brilliantly mapping the steps in visual form! process mapping really well done. Hey guys, what tool do you use Megan for the journey map? Can people recommend good free alternatives? Great stuff… very helpful video. Well Done Megan! Great video. One thing I’d maybe add for what it’s worth is the idea of interviewing Stakeholders as you begin the process. They can add some great ideas into what they perceive the customer pain points and relevant journeys to be. But more important than that, is that the Stakeholders will be more “bought-in” to your feedback when you present the final Journey Map product. That part is priceless. Hi, thanks for such an a valuable and insightful article. I’m just curious to understand more about affinity diagram. Could you elaborate more? From my understanding, I gathered that affinity diagraming is more of an activity than a documentation that requires a team discussion to gain consensus and categorize the deliverables from the preceding procedures into something more visual/documented? Could you elaborate more and point me in the right direction? Trying to get in touch with Mad Pow Megan Grocki, does someone have her direct email address? Some time has passed since we did that, but I think it’s still actual for the community. This year we’ve published a list of free customer journey maps templates here – https://uxpressia.com/templates. 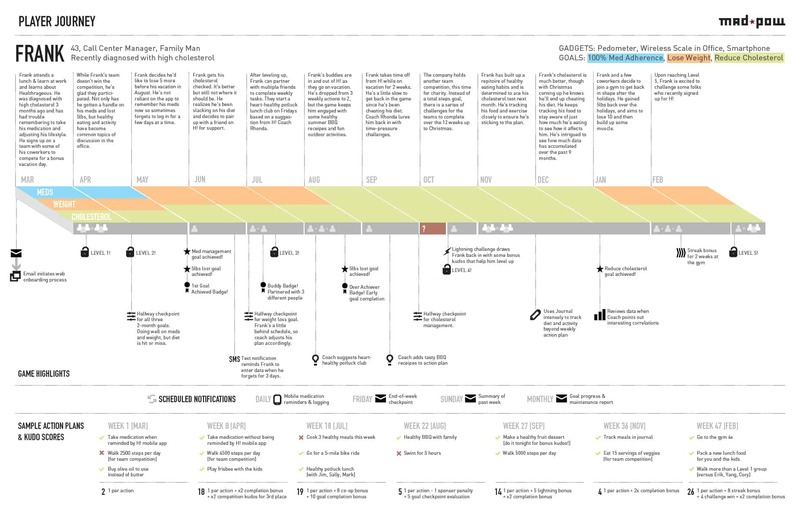 It is a pretty bunch of customer journey maps templates created for different business domains (including Healthcare, Travel, Banking, Telecom, etc.). All of them are based on the actual experience. You can download the template as PDF or start creating online map inside our tool based on that template. All perfect and fine, but what I am always missing in discussions about user journeys is an overview of what we are ‘competing’ with. To achieve a touchpoint (meaning the client or user gives his or her attention to my app, or my service, or simply to me), what else is screaming for attention that the user then has to ignore. Not sure if I am there yet. What do you think? Is ‘competition’ an issue in user journey mapping, and how do we best deal with this? Great article!! In addition to all the pointers mentioned, would like to add the importance of CRM in regards to customer journey mapping. Traditionally retail stores, call centers, social media, and other channels were separately managed. However, now businesses cannot take the risk of handling these channels separately as it will result in a disjointed customer service. to have a consolidated view of the customers and deliver consistent experience across all channels. So whether customers want to make a purchase, renew a service, or resolve a problem, they can do so in any of their preferred channels. I dont see the highs and lows in the CJM? This post illustrates well on this concept, thanks Megan, hope I have chance to translate the article into Chinese soon. This is an awesome and very helpful post! Thanks for sharing these tidbits! I’d love to learn more. This is immensely resourceful and precise. The nuances of user journey and the process explained in a lucid manner, keeping in mind the user journey of the reader. That’s a story within a story, using your technique to explain your technique. Thanks a ton, Megan. God bless! Great post and video, thanks. Thanks for sharing, very useful post. This is a really great article…concise with a great visual that really ties everything together well. However, I struggle making these types of documents because of the abstraction. Frank isn’t real and the behavior pattern (the “journey”) has never happened. I know you pulled this from real data, but since I can’t tell what is real and what isn’t from this doc I am treating real behavior with equal weight to behavior you made up. In fact searching for Healthrageous reveals a postmortem that admits they overbuilt and didn’t focus enough on market fit. This document fully embraces that admittedly flawed business approach…almost celebrates it. Do you think this document contributed to a false sense of security? Do you think it would have helped to surface more about what was real and what wasn’t, or is this document format more a symptom of this client’s approach than a cause? I’am a trainee from Huawei Tunisia, i want to create a customer journey map and i’m looking for some examples of customer journey map for a telecom operator. Can you help me please with some design examples? I will be very grateful. Thank you.